It’s a fantastic thing when the wonderfully strange crosses your path by way of an Istrian visiting Spain. Such was the case with this bottle of what I can really only call dessert wine from Miloš. That’s not really the right word as it’s actually a “half-sweet” Croatian wine. These pop up here and there as there are many people in the region who like a much sweeter wine than the “dry” wines that most of us know. I find many of these putrid like the one at Dingač Vinarija because they artificially create it with added sugar, but this, this is something to take note of. This slender bottle is 100% Plavac Mali and, as it should be, has an abv of 15.8%. That’s about where all normal descriptions stop though as the flavor is really something different than any wine I’ve had before. It’s like if you were to float your mouth in a bowl of emulsified dark berries while a cloud of almonds and hazelnuts descended on your nose. A bit surreal of a description? Oh yeah. 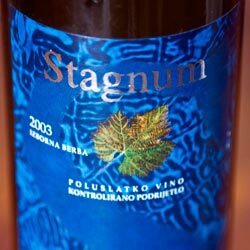 As I can’t tell if I like this wine or I don’t, which ultimately means that I completely do, but in an academic way because it’s thoroughly and truly unique. There’s no way I’d pair it with anything though as it has all these large, buoyant flavors that would trounce most any meal. For the end of a meal? Definitely. As different and odd as it is, cleansing the palate is something it does well. Not the least bit cheap though at 41€. Great description, that evening in Barcelona I was too lazy to take any notes. Just I remember it was damn different from anything I tasted before. Is it a bit like porto but naturally fortified and just a tiny bit oxidized? Maybe a bit oxidized. It doesn’t seem that he uses the sol-i-serena method they use here to make sweets from red grapes though. Could have just been the temperature as I think it was like 32C at night when you were here. Tried it again though after time in the fridge and it was still a very different wine. That’s always been my problem with Miloš in that it seems like he’s running his winery as a hobby with these oddball wines that are truly unique followed by others I have no interest in. You really, really need to know which of his vintages to get.